How Do I Purchase Essential Oils? I am regularly asked by students how to buy essential oils. It may seem like a basic question, but it’s not as simple as it sounds. There are several things to know about plants before even deciding which essential oil to buy. Knowing and understanding the plant’s Latin name is an important place to start. People often use the common name of a plant when referring to it and the properties it has. This can cause confusion because common names can be misleading, but having the Latin name (the italicized one in parentheses) can clear things up. Let’s use Chamomile as an example. You may see German Chamomile and Roman Chamomile mentioned and think that they are both Chamomiles so they work the same. German Chamomile (Matricaria recutita) is wonderful for skin healing and to reduce inflammation, while Roman Chamomile (Chamaemelum nobile) is antispasmodic, relaxing, and great for children. They have other large differences as well, notably their scent, color, and plant chemistry. They have very different therapeutics and are used for different reasons. Now you have the Latin name figured out, but see “var.” listed after it. This stands for Variety and differentiates the characteristics of plants within the same genus and species. An essential oil where the variety is very important is Hyssop (Hyssopus officinalis). If it has no variety listed then it the common plant that has a potentially toxic constituent in its chemistry. However, Hyssopus officinalis var. decumbens does not have the toxic component. Therefore, I only recommend the decumbens variety as it is deemed non-toxic (and helpful for asthma sufferers). After I had been studying essential oils for awhile, I realized how truly important their Latin names were. Upon visiting a Lavender festival I decided I had to take a plant or two home. 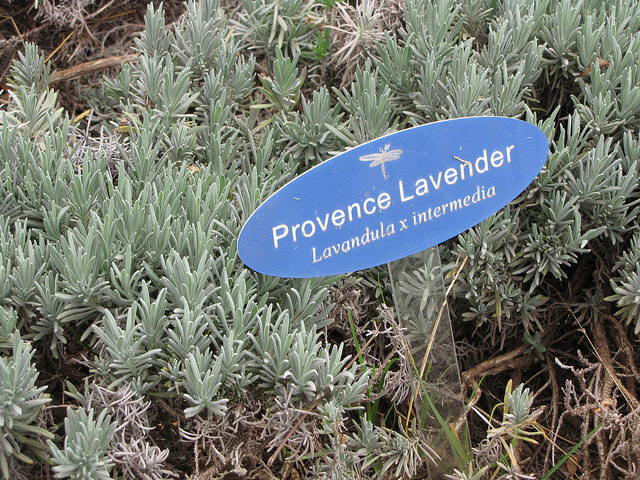 I saw a few potted plants that were listed with Latin names that had an “x” in them – Lavandula x intermedia. I knew these were hybrids called Lavandin, as signified by the “x,” and that they were a cross of Lavandula angustifolia and Lavandula latifolia. While angustifolia has a sweet scent, latifolia has a strong camphor smell. The hybrid of intermedia also has this camphoraceous scent, and the stimulating effect that goes along with it. I knew that I would not like those plants so I found a few that weren’t hybrids. Knowing Latin names of plants is important in buying the best scented plants and also the correct essential oil. If the complete Latin name isn’t included on the bottle – for instance, it’s just called Lavandula – then you should ask questions or pick another supplier. And now that you are Latin savvy, you can find the essential oils that will work best for you and know how to buy them.